A new report on the state of the newspaper industry in Argentina has found that federal appropriations for newspapers have resulted in less coverage of government corruption. This study goes to the heart of the 'newspaper bailout' debate in this country, and demonstrates the danger of supporting the news media with government funds (h/t Mark Tapscott). 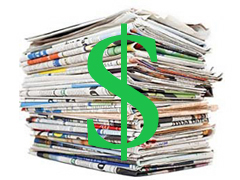 Many liberal media commentators have called for direct federal subsidies for ailing newspapers, arguing that federally-supported news media are essential to democracy. The most prominent group in this camp is Free Press, founded by liberal media guru--and avowed socialist--Robert McChesney (incidentally, McChesney has avidly defended Venezuelan President Hugo Chavez's crackdown on opposition media outlets in the country). develop new means for subsidizing the press through new private revenue models or public interventions to restructure or supplement market forces. And it is difficult to imagine how this can occur without government getting involved in some capacity. But, one might ask, wouldn't government involvement in the news industry necessarily result in the overt politicization of the news? Well, the answer is yes, as Free Press readily admits. The organization advocates government involvement in the news media to promote causes deemed (by the government) politically favorable. Newspaper owners might be more inclined to sell to socially motivated parties if the government offered certain subsidies or other incentives to facilitate the transactions. Free Press also sees government involvement in the news business as a means to promote the agendas of "underrepresented" groups. Such involvement would "greatly increase minority and female ownership of news media outlets, which currently stand at an appallingly low number," states the report. recent academic research shows that news organizations receiving government subsidies are no less critical of government than those that aren’t subsidized, and the former tend to present a wider range of voices and viewpoints. These claims are contradicted, however, by a new study by Harvard University’s Rafael Di Tella and Northwestern University’s Ignacio Franceschelli. This study found "a strong correlation between [newspapers'] willingness to cover government scandal and the amount of money they received from government coffers." Their analysis found a “huge correlation” between, in any given month, how much money went to a newspaper and how much corruption coverage appeared on its front page. For example, if the government ad revenue in a month increased by one standard deviation — around $70,000 U.S. — corruption coverage would decrease by roughly half of a front page. very real rewards for corruption coverage among the newspapers’ audiences. One extra full front-page worth of corruption coverage a month was associated with a nearly 8 percent increase in circulation. So cutting back on corruption stories seems to lead to less circulation revenue — even if it’s associated with extra government money coming in. The left may attempt to increase government control over the news media through bailouts for major newspapers. This study shows the detrimental effects that such a policy would have on the Fourth Estate. As soon as Obama bailed out Detroit, he forced out GM Chairman and CEO Rick Wagoner. The White House also gave majority ownership in Chrysler (55 percent) to the UAW. Wall Street bailouts resulted in overnight government regulation – even salary controls. Government intervention in media gives Obama the same opportunity to control the news. Seven major newspaper chains have gone into bankruptcy. If he uses the same strategies he used for Detroit, that would let Obama control major media outlets across the nation and he could dictate the news. The administration demonstrated the level of control it exerts over compaines that take government funds when it unveiled plans this week to dictate compensation for employees of companies that took federal bailout money. An unelected and unconfirmed federal official--Pay Czar Kenneth Feinberg--retains the power to dictate the payment of employees of private companes, all because those companies accepted federal funds. This level of control is completely antithetical to a free press. It should come as no surprise that the discretionary allocation of federal funds will always breed a say in or control over content--or at least discourage content that could jeopardize a paper's federal lifeline. This precise statistical study of the real life consequences of such a policy should dissuade Americans from supporting any financial backing from the federal government for the nation's leading news outlets.